Yea!!! My daughter is home for a short visit. Which means I get a break from cooking. Today I will be her sous-chef and dishwasher (hey, I didn't agree to that!) as she prepares a Southern dish that her friend from Virginia made for her while they were roommates in North Carolina - Tomato Pie. 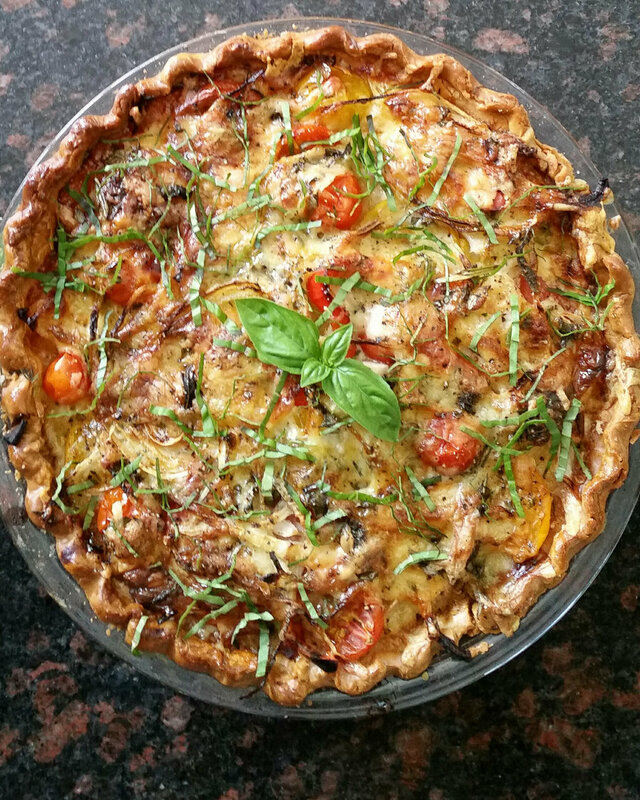 With juicy vine-ripened tomatoes from my husband's garden and fragrant herbs from Carrie's garden, we can't go wrong with the recipe! But first, a little background on my awesome daughter. Sierra began showing interest in food and cooking at an early age. When she was 7 years old she planned, shopped, prepared and served her first 3-course meal. In high school she hosted her own podcast discussing interesting food related topics such as, the important role that food can play within our armed forces. She has work on-the-line in professional kitchens since she was 16 years old, has spent a summer working on an organic farm in Italy, and has traveled all over Southeast Asia tasting local street fare, exotic foods and delicacies. So, it's interesting that on this visit the first dish she wants to make us is such a simple dish. Tomato Pie is a traditional Southern recipe found throughout the Carolinas. It can be eaten for breakfast, a light lunch served with a mixed greens salad, or just as a snack. And, because it's best served at room temperature it's a perfect dish to bring to pot-lucks. Most Southern households have their own tried and true recipe for Tomato Pie. 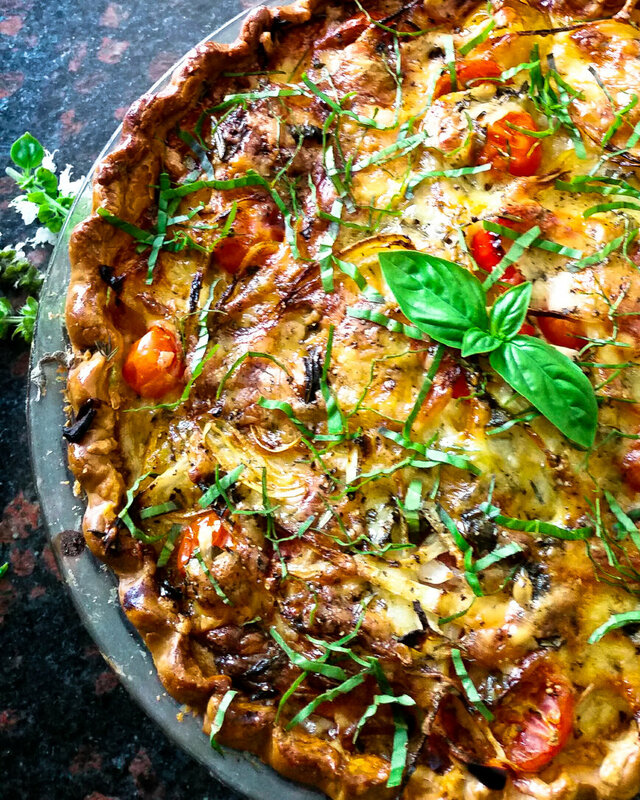 With slight recipe variations in the dough, crusts, herbs, cheeses or type of tomato. However, the one aspect that does not change is the use of only fresh picked ripe regional variety tomatoes. Making this recipe when the tomatoes are in season ensure that the deep tomato flavor really comes through. So, the next time you have ready-to-pick tomatoes in your garden, a friend gives you a sack full of tomatoes, you need a dish (it's vegetarian too!) to bring to a pot-luck, or you just want to eat something yummy, please give this simple yet magical Southern dish a try. Roll out pie dough to fit a 9- or 10- inch deep-dish pie plate. Place dough in plate and crimp edges. Refrigerate, covered for at least 30 minutes. Remove the pie shell from the refrigerator. Prick dough all over (bottom and sides) with fork. Bake for 12-14 minutes, or until lightly brown. Remove the pie crust from the oven Lightly beat the egg white with a fork then brush it onto the entire surface of the warm pie crust. Allow the pie shell to cool and the egg white to set. Slice the tomatoes into rounds 1/4- to 1/2-inch thick. Place slices on paper towels then sprinkle with salt and pepper. This will help remove some moisture and prevent a soggy pie. Combine the mayonnaise with the egg yolk stirring until smooth. Sprinkle one third of the breadcrumbs over the bottom of the pie crust. 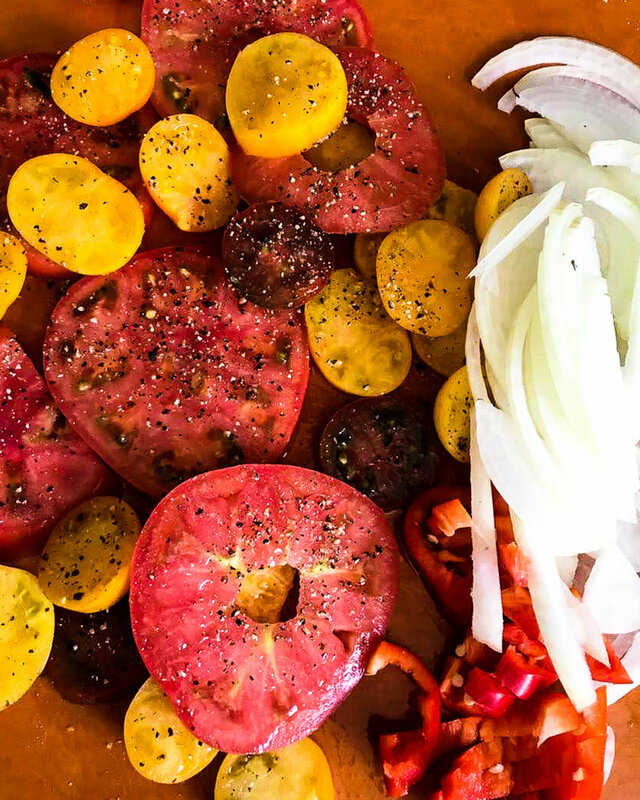 Layer half of the sliced tomatoes over the breadcrumbs in a circular pattern, and top with half of the sliced sweet onions and white scallion slices. Using a spoon, drizzle in half of the mayonnaise mixture, and top with half of the herbs, half of the Fontina, and half of the sharp cheddar, and half of the remaining breadcrumbs. 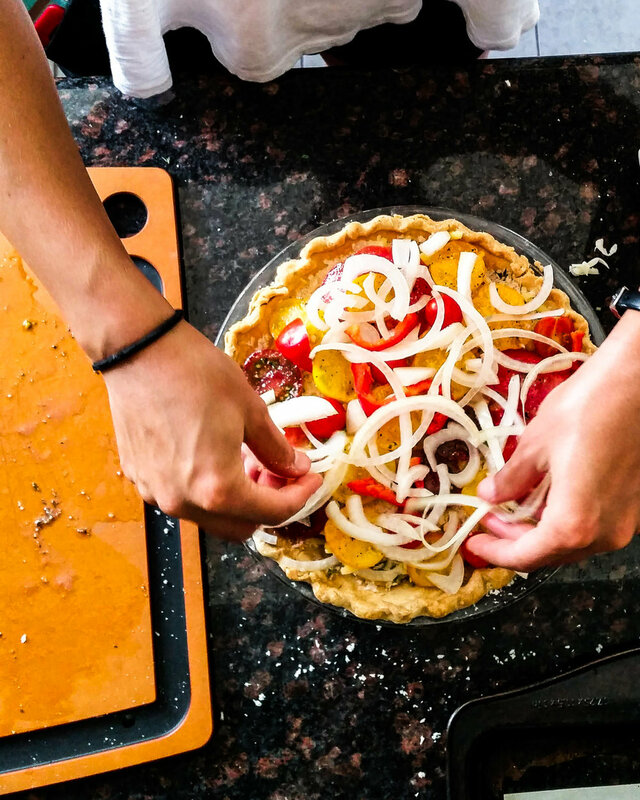 Make a second layer with the remaining tomato slices, sweet onions, white scallion slices, mayonnaise mixture, herbs, Fontina, cheddar and breadcrumbs. Lastly, drizzle the olive oil over the top, and sprinkle with the Parmesan cheese. Bake the pie on a rimmed baking sheet in the middle of the oven for 50 minutes to 1 hour, until the crust is golden brown and juices are slightly bubbling. Scatter sliced scallion green tops and any left over herbs, over top. Allow to cool for at least 30 minutes before cutting into wedges. This pie is best served at room temperature.